DeltaGlassä high temperature tape is heat, flame and fire resistant. Fiberglass (fibreglass or glass-fibre) woven tapes are fabricated from high quality type E fiberglass that will not burn and will withstand continuous exposure to temperatures of 1200°F / 648°C. Available thicknesses include 1/32", 1/16", 1/8", 1/4". 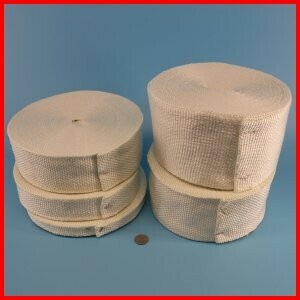 These tapes are available with Pressure Sensitive Adhesive to aid in placing the tape.